Our first baby of 2017, Winnie, arrived a little earlier than expected, but is happy and healthy and fitting in with the herd! 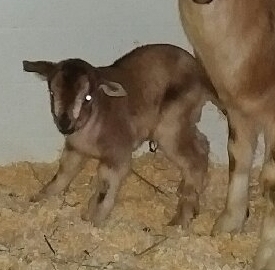 She is the first Arapawa born on the farm. Heritage breed animals are older breeds that were prevelant on farms in early America. They were then bred and cross bred to be bigger, faster, and more commercial. We are hoping to help increase the awareness of these "endangered" farm species, help replenish and extend their population, and hopefully help to develop and/or enhance a market for their products (meat, eggs, etc) which should prove to be superior in quality to the commercial brand animals. 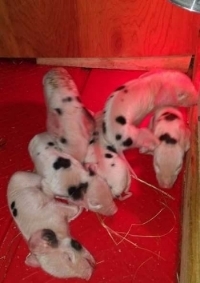 On March 15th we got our first farrow of piglets. We were blessed with a small introduction with only 6 babies (more than enough to keep us busy). West Wind Farm is located just to the south of Mill Pond on Mill Lane in Brimfield. We are the lucky "new owners" (we are planning on being called the new owners for the next 20+ years) of one of the most beautiful properties in Brimfield (or in our estimation, one of the best properties in Massachusetts and beyond!). We are happy to develop this property back to its farming roots and be able to offer tours, and Brimfield Antique Show Parking so we may be able to allow other people the opportunity to see the property and visit with our Heritage breed animals. In the tradition of the former owners, Don and Pam Moriarty we hope to be good stewards of the property, keeping it a peaceful background to the Antique Show and for our neighbors and community. We hope to be true to its past, and navigate it successfully in the future. We love our poperty and its animals, and we hope you will stop by and visit. We have begun the work to become a non-profit company to help preserve farms and farm animals. Over the years, we hope to be able to offer parking to Brimfield Antique Show goers for a donation which will be used to maintain this property and grow our rare breed animal farm, and also start a fund to help purchase or provide easements over historic, aesthetically significant farms. This is very similar to how local land trusts work, but with a focus on working farm land. Currently in Massachusetts, there is only the APR program within the Dept of Agriculture that does this, but there practices are extremely restrictive and has scared more farmers away from preserving there lands due to the requirements and oversight. We hope to change this, and successfully work with farmers to preserve their lands. Our very own weather station, sitting atop our barn! © West Wind Farm, 2017.